Roy Hibbert came into the NBA a talented, but very raw, player. Now that he has a few years under his belt, Hibbert has become one of the best big men in the game and helped turn around a floundering Indiana Pacers franchise. The Pacers are now one of the top teams in the NBA and the formidable 7'2" center is a huge reason why. Collectors have not completely warmed up to Hibbert yet, but he has the potential to go down as one of the best centers of this era. Because of this, Roy Hibbert cards and autographs remain a good investment, despite the hindrance of playing for the small-market Indiana Pacers. 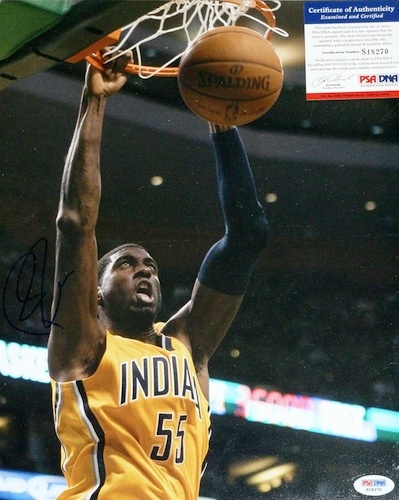 Shop for Roy Hibbert cards on eBay. 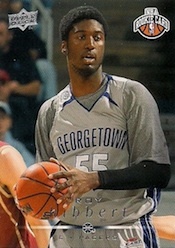 Roy Hibbert followed a long line of successful NBA centers, such as Patrick Ewing, Alonzo Mourning and Dikembe Mutombo, by attending Georgetown University to play college basketball. Although he was touted as a possible lottery pick earlier in his college career, Hibbert elected to play all four seasons with the Hoyas before declaring for the NBA Draft. He did not progress as expected during his Senior season and questions remained about his productivity and foul trouble. Due to this and a deep draft that included Derrick Rose, Russell Westbrook and Kevin Love, Hibbert slipped to the 17th overall pick. Although he was selected by the Toronto Raptors, he was soon traded to the Indiana Pacers and has spent his entire career with the team. After a solid, but unspectacular rookie season, Hibbert slowly started to fulfill his potential. Multiple seasons of growth culminated in consistent playoff appearances for the Pacers and Hibbert's first All-Star appearance during the 2012-13 season. With the emergence of Paul George, the Pacers are primed for a deep playoff run and only the Miami Heat stand in the way. 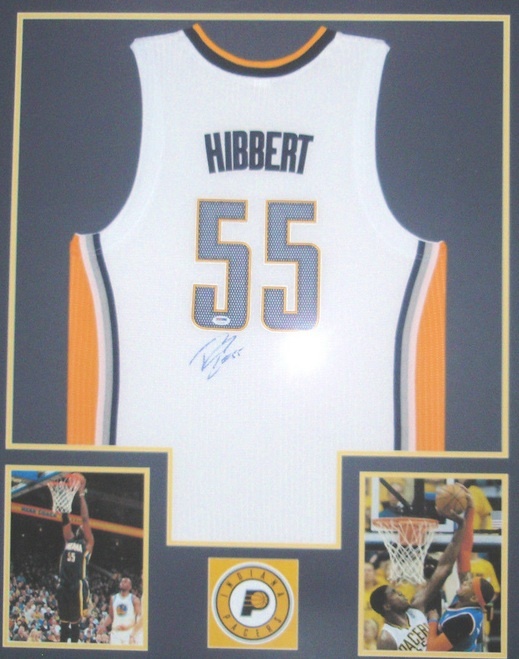 Hibbert is crucial to the team's success and if he can lead them past the Heat and to the NBA Final, his cards and memorabilia will spike. Outside of his basketball career, Roy Hibbert made a memorable cameo appearance on the television show, Parks and Recreation. Unfortunately, he was not included in the Parks and Recreation card product. 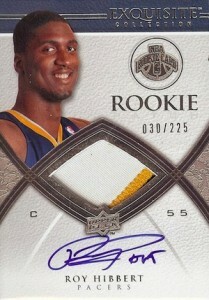 Roy Hibbert has over 20 rookie cards for collectors to chase and most are very reasonably priced. The top three Roy Hibbert cards from his rookie season can be viewed below and his full rookie card checklist can be seen on the next tab. 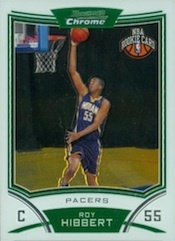 Like many of the players from this decade, the top Roy Hibbert rookie card comes from Exquisite. An on-card signature, small jersey piece, and lower print run make for a great card. Despite the brand name, prices are not ridiculous. 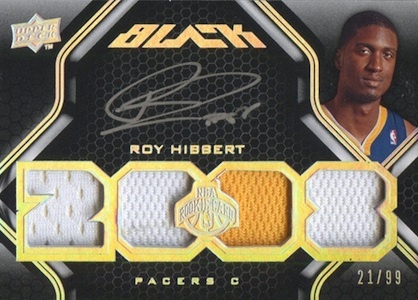 With a print run of 99, UD Black offers the rarest signed rookie card for Roy Hibbert. The silver ink, black background, and gold foil may sound like a design conflict, but it strangely works. *There are not a ton of items available for Roy Hibbert, and many signed items for Hibbert feature his alma mater, Georgetown University. 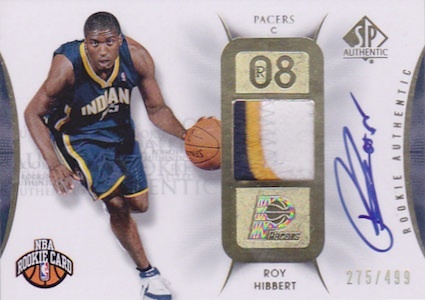 In this section, you will find examples of what an authentic Roy Hibbert autograph looks like. This can be used as a first point of reference for determining the legitimacy of autograph memorabilia, but is not a substitute for having your items authenticated by a well-respected professional autograph authentication company. Reputable authentication companies include JSA, PSA and Mounted Memories, to name a few.